Why is it worth having a business partner from Poland? Opinion Printing Company operates in various business areas. Starting from production to businesses services. What we frequently see is that vast amount of Polish companies cooperate with west part of Europe. Isn’t that interesting that a lot of people are cooperating with Polish-based companies? We decided to write this post, and analyze the reason behind it. The first thing that comes to mind is the price. That is the easiest and most frequent answer, which is not completely true. But let’s focus on price at first. It is a fact that many products and services are simply cheaper in Poland. It is mainly because of a labour costs and European Union funds. However, cost differences between Poland and Western Europe are not so extensive any more. Surely costs are much lower in other Eastern European Countries like Bulgaria, Romania or Ukraine. Why should you have a business partner in Poland? We strongly believe that pricing isn’t the most important factor. We all know that competitive business cannot be built only on low price, there must be other more important reasons. We will describe most important ones below with a short explanation. Poland is perfectly located on Europe’s map. We can deliver our products to all regions in Europe without any problem. Furthermore – costs and conditions can be almost as good as local supplier. For example, Opinion Printing is able to deliver prints to many countries even faster than local suppliers. It is a great business value, as time of delivery is currently getting more and more important for B2B and B2C customers. Imagine that you would be able to deliver faster and cheaper to your customers. Would it affect your business? We are not afraid to compare our quality to the best companies in the world. We are generally known for extremely good ratio between price and quality. It comes with a very good reason. Every company which grows quickly is more or less focused on processes. Effective process is the factor that guarantees quality. Because quality must be good always – not from time to time. School system in Poland is one of the best in Europe. For example, we are proud to have one of the best IT engineers in Europe. 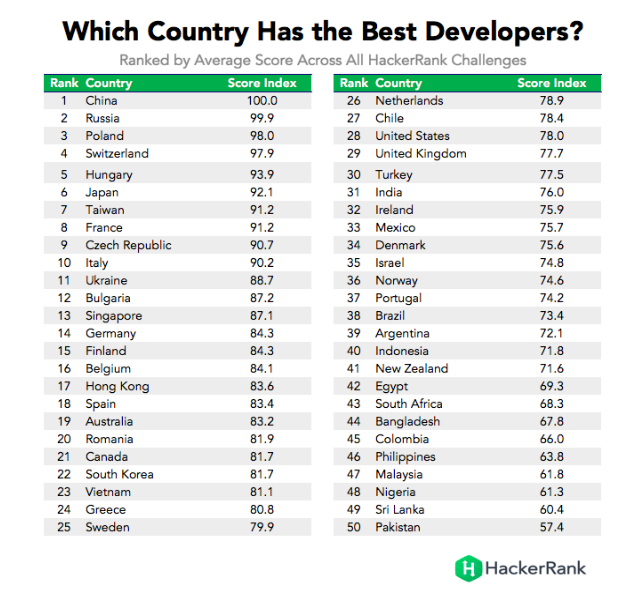 In the HackerRank, Polish engineers were ranked as third best in the world! That’s something worth noticing. Polish companies focus on growth and often provide very good service. For example our team is focused on expanding business of our partners – we help them grow their profits and achieve their professional satisfaction. This helps us to provide best service possible. We are not afraid to build our competitiveness on a modern technologies. For example, you will be able to connect with your partner using EDI – Electronic Data Interchange. It helps to maintain cooperation costs on much lower lever than with a local supplier. These are not the only advantages of partnership with a Polish supplier. I think that one of the most immeasurable factors is engagement. We simply love what we do. In Opinion Printing Factory, over 90% of our clients are from Western Europe. We believe in every factor described above and our work on a daily basis relies on improving the buisnesses of our clients. Do you think there are other reasons to cooperate with a supplier form Poland? Please share your thoughts in comment section. Feel free to send us an e-mail if you search for a reliable Large Format Printing supplier! We are a large format printing factory located in Poland. We specialize in supporting our partners businesses. Check more details on our website.